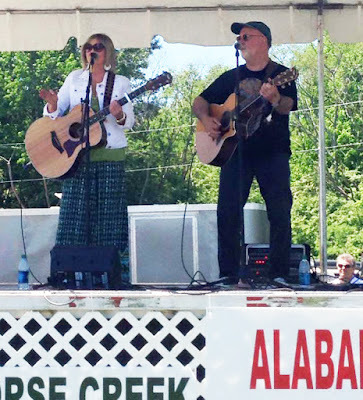 Jilda and I are playing the Horse Creek Jubilee festival tomorrow afternoon. We drew the last slot at three p.m. Normally, the last group that performs is the finale. In a sense we are, but experience has taught us that by three p.m. at festivals, most people are tired of chasing children cranked up on funnel cake, cotton candy, and snow cones and are ready to head home where they will swill a 12-pack of beer and ice down their feet. So in order to drum up some support, we had to do a little self-promotion. I decided to advertise on Facebook that those who stay for our show have a chance of winning a bass boat with a 500 horsepower inboard Evinrude motor along with $7 thousand dollars worth of fishing gear. And, to pull the craft to the river, we're giving away a new Ford Explorer. As a disclaimer, I noted that these prizes were contingent upon us hitting the lottery. If in fact, we do win the lottery, we will also throw in a puppy. But, if we don't win the lottery, all those who stay will get a hug. I'm not sure how this will fly on Facebook, but we thought it was worth a shot. But we're open to suggestions. Hm, I don't think anything contingent on you winning the lottery is a good bet somehow. I do hope people will stay for your performance. So miserable singing to an empty hall, as it were. I do hope you win the lottery too. I would take one of those hugs by the way. Very smart! Let us know how that goes. Wow. Are you selling snake oil as well? I think it is the only thing you left out. One way or the other, I hope you have a good day and good weather too ! Do a raffle to be drawn at the end of the show and must be present to win. Or maybe free prizes for the kids. Just a thought. Either way, I know yall will do great and I for one would stay to hear it. If I win the lottery I'll put you guys up in Ashland's finest and book you for the closing act at the fair and balloonfest! I'd show up for the hug actually! Hope it's a great show with tons of folks to enjoy your music! I'll be curious to learn if people find this amusing and support your musical efforts. Good luck with your future efforts, lottery-like promotions are always a success ( CongaLotto review ), but I think that was your talent that brought people together.